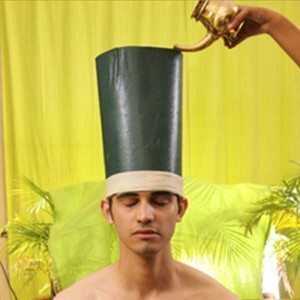 The Shiro Basti treatment is warm oil poured onto the head, and then allowed to remain there for a certain period of time and then followed by shiro abhyanga (head massage). Beneficial for the treatment of depression, headaches, insomnia and psychological disorders. A nurturing head and neck massage (shiro abhyanga) uses warm oil to de stress and relax. This treatment helps improve dryness and hair loss while calming the nervous system and strengthening the mind. Leave feeling revitalized.